Kyiv’s Independence Square didn’t look like I remembered it; granted I had never physically been there, but had seen it in many documentaries about the Revolution of Dignity, or Euromaidan. It was a Monday morning, but it could have been a Saturday afternoon: Independence Square was bustling with life. People hurried down the stairs into the underground subway station, while others sat on benches without a care in the world. The whole scene had an almost Mediterranean air to it. Street vendors sold football scarfs, old books and Soviet memorabilia not far from where taxi drivers waited for customers while smoking one cigarette after the other. I looked around and saw myself surrounded by the imposing Soviet neoclassical architecture that was built on the ruins left in the wake of World War Two, when most of the square was reduced to rubble. The only exception to the architectural uniformity was the restored Trade Unions Building, built in 1980 and burned down during the Euromaidan Revolution in 2014. 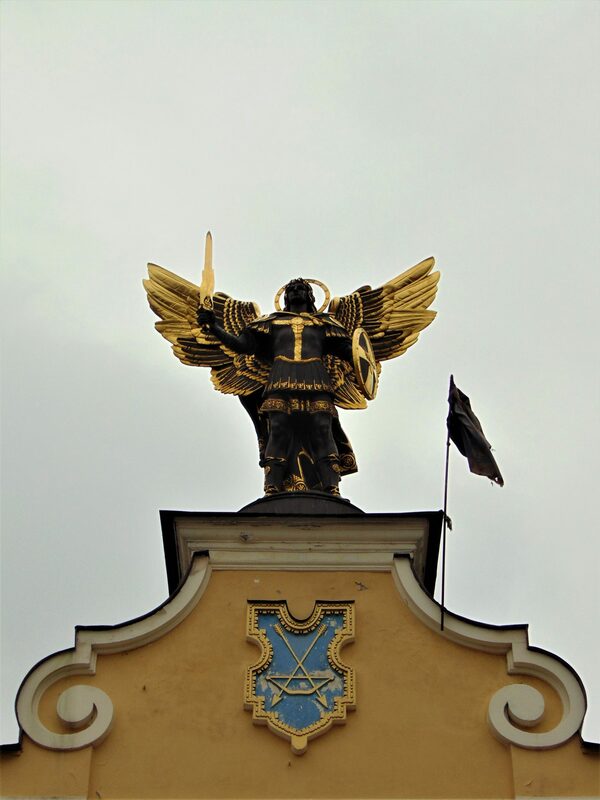 In the center of the square was a fountain, and right behind it the reconstructed Lach Gates, with the Archangel Michael (Kyiv’s patron saint and protector) standing on top facing the independence monument across Khreshchatyk Street—Kyiv’s major avenue. As I was walking about, an object resting on a light post caught my eye: It was a battered wooden shield. 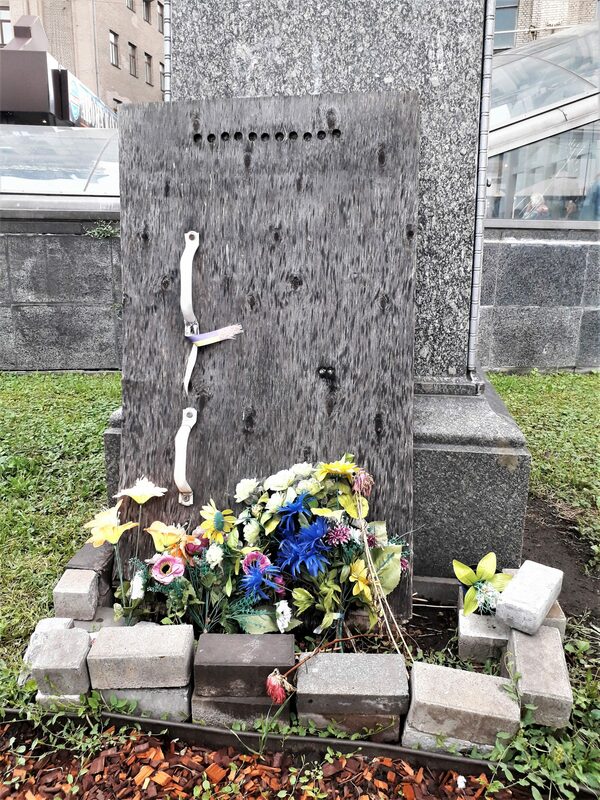 The flowers around it suggested that someone had died there. Independence Square is impressive not because of its design but because of its role as a stage for political protest and revolution. 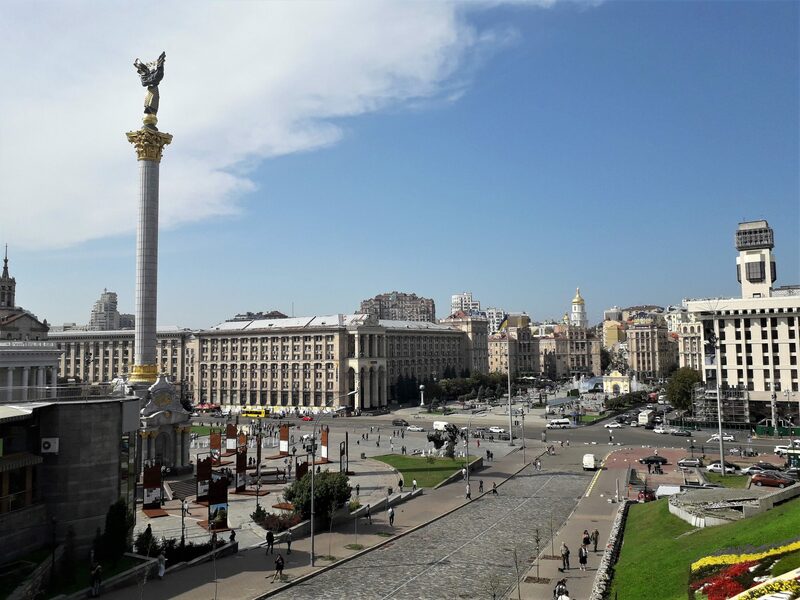 The square has seen four major political events ever since Ukraine became independent; the most important one, the Euromaidan, took place in 2013/14. 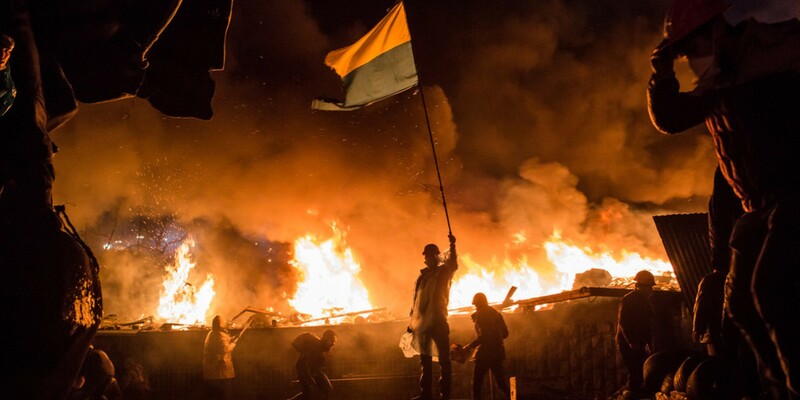 More than a protest, the Euromaidan was an all-Ukrainian political movement that started in late November 2013 to demand closer ties to the European Union in the wake of pro-Russian president Viktor Yanukovych’s decision to back out of a treaty with Europe in the last minute. 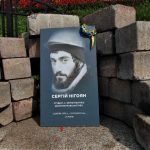 People of all backgrounds took to the streets not only in Kyiv but in all Ukrainian major cities to demand, among other things, the resignation of the president. 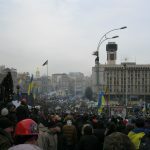 The protest mirrored Ukraine’s diversity, as the movement brought together Russian and Ukrainian speakers, Crimean Tatars, Jews, and other minorities such as Georgians and Armenians. However, the protests escalated due to the intransigence and excessive use of force of the government, and turned deadly toward the end of January 2014. 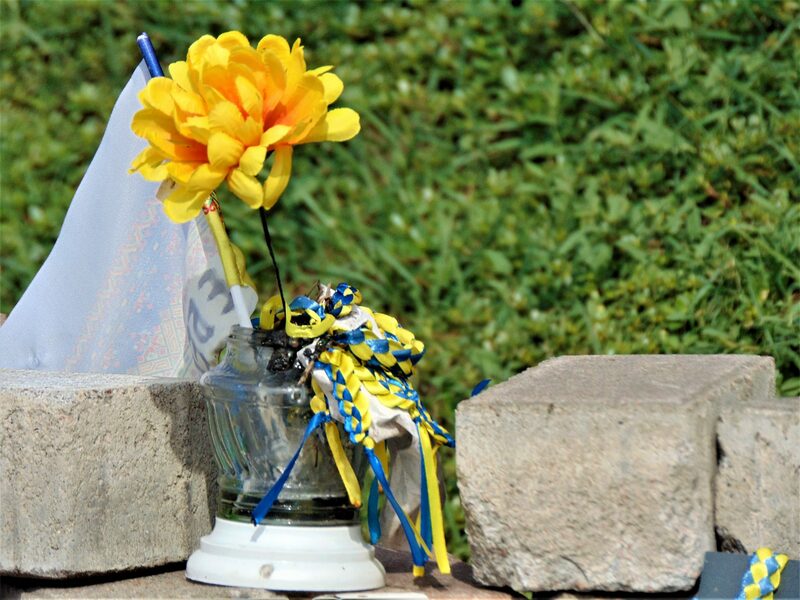 The Euromaidan protest then became a revolution. Independence Square became a war zone. Scenes of Berkut special operations officers firing at demonstrators from close range, protesters armed with makeshift shields and wearing motorcycle helmets throwing Molotov cocktails at the security forces, people taking cover from sniper fire behind burning barricades. The cobblestones had been lifted from the streets, and the barricades were covered by layers of molten tires and snow. 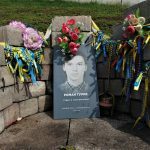 Ukrainian flags flew amid black smoke and flames: the blue and yellow flag, representing Ukraine’s golden fields against a blue sky, and the more menacing red and black flag, which represents the blood spilled on Ukraine’s black soil. It was February 2014. I was in Krakow, Poland and remember being glued to the TV in disbelief. The revolution was being televised. I walked further down across Khreshchatyk street to see the Independence monument. 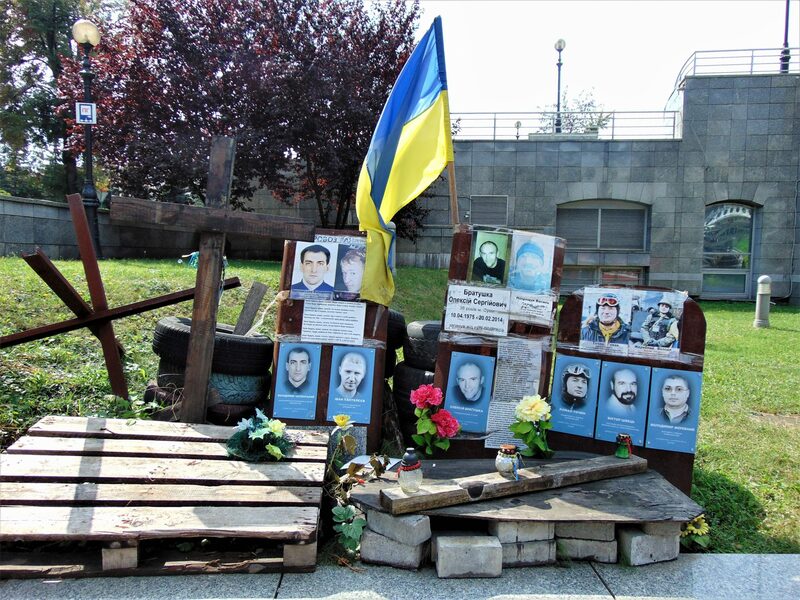 The monument, which was only built in 2001, is now surrounded with pictures and information on the Euromaidan Revolution and the ongoing armed conflict in Eastern Ukraine. Underneath the monument you can still the scrawlings left by the demonstrators. 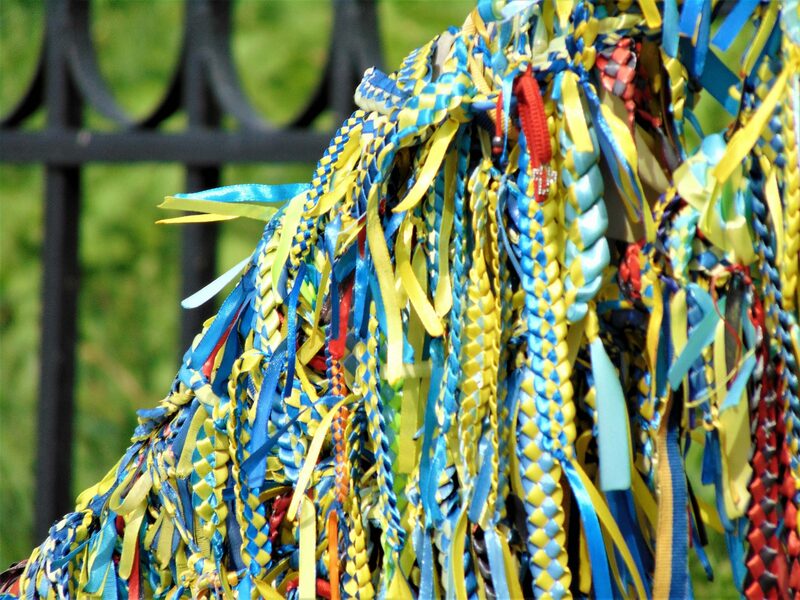 As I was looking at the pictures I was approached by a younger guy selling blue and yellow bracelets. That is not uncommon in Ukraine; it started as an effort to collect funds for the military and hospitals, but others quickly took advantage of the sympathy of the people and started selling them for personal gain. The salesman in this case seemed to be aware of it—at least when I started asking him where the funds would go. He then gave me the business card of his organization and took out his cell phone to show me pictures of him personally delivering aid to the front line. I talked to him for a bit, and could tell that he genuinely meant it when he said he was happy that a guy from Mexico cared for Ukraine. Next to the independence monument is the Boulevard of the Heavenly Hundred—named after the protesters who died at the hands of the government. 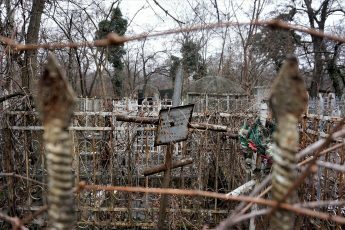 Over one hundred people lost their lives at Independence Square, but in this case the term “hundred” (sotnya) refers to a military division composed of around one hundred persons. I looked across the street and saw one of the several gravestones that dot the square. 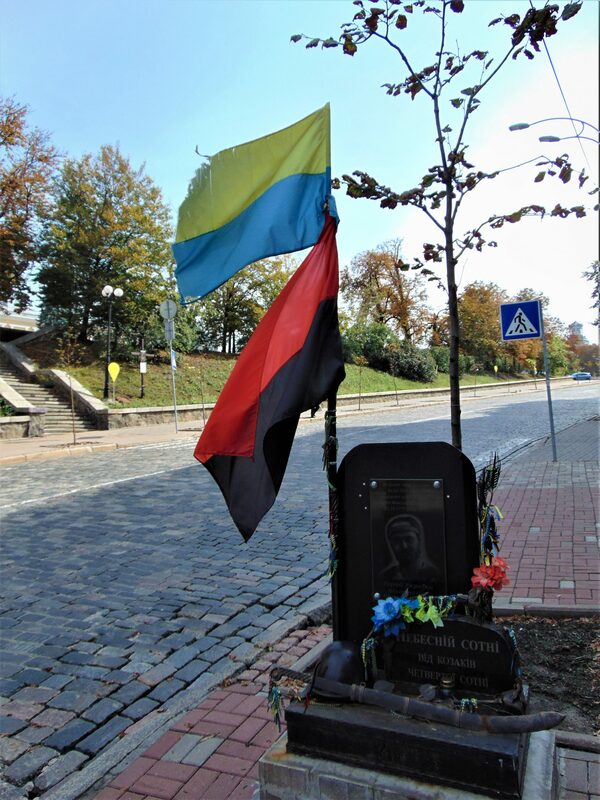 That’s when I realized that despite the hustle and bustle of the square and the clueless tourists taking pictures, Kyiv’s Independence Square is a very large memorial. 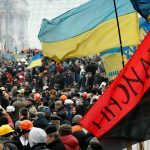 The Euromaidan was a pivotal event in Ukrainian history; it actually accomplished its goal of getting rid of Yanukovych, and it was all done by people going to the barricades after work, or by volunteers who put their lives on hold to basically live at the square, in winter, and endure the brutality of the police. 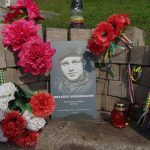 The portraits of those killed line the Boulevard of the Heavenly Hundred; the installation has a makeshift character, as the portraits simply rest against the cobblestones that were once ripped from the streets to be used as projectiles. The portraits list the name, age, profession and provenance of the deceased. People came from cities all over the country, both from the East and the West, and from other countries such as Belarus and Georgia. 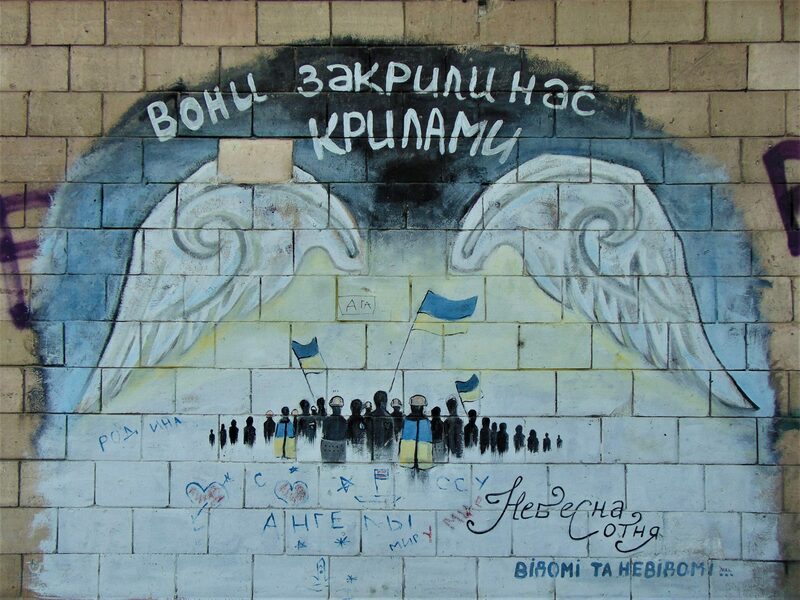 Some of the members of the Heavenly Hundred have achieved almost folk hero status and been immortalized in the hagiography of the Revolution; one of them is Serhiy Nigoyan, known by his nom de guerre, Birmen (Armenian). An ethnic Armenian, Nigoyan was one of the first protesters killed. 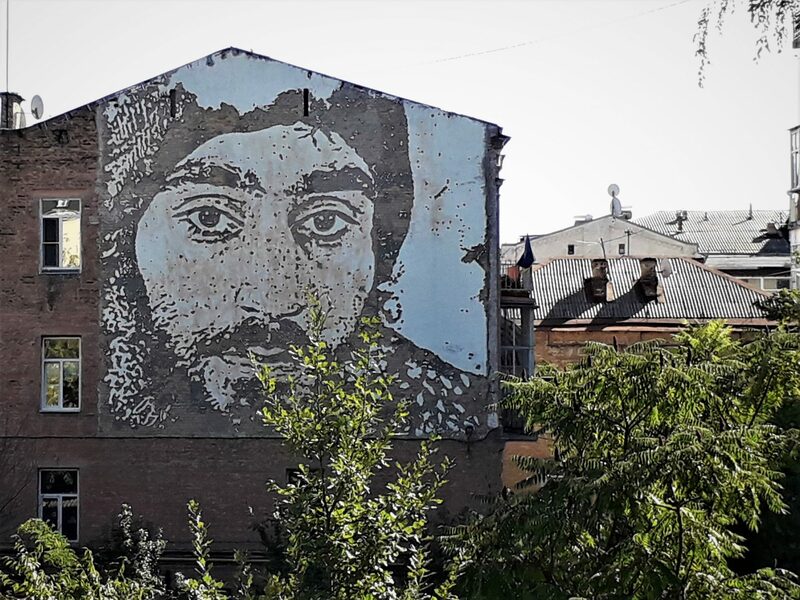 Now, his likeness can be seen in many places, including a giant mural on the side of a house right by St. Michael’s monastery in Kyiv. Rockstar historian Timothy Snyder explained that, while in the Soviet era there were two competing political myths and understandings of history, which were based on the memory of World War Two, the Euromaidan protests, the push for European integration and the experience of foreign invasion and war build the modern nation-building basis for Ukraine, and thus Independence Square is hallowed ground in Ukraine’s national cosmology. Independence Square left a lasting impression on me. I was moved by the sacrifice that took place there but also from the love, respect and appreciation that people continue to show for those who died. The way the Revolution is remembered has a very DIY feel to it—just like the Revolution itself. 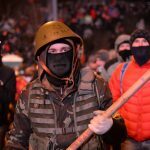 It was not state actors but everyday people who took over the square and faced the state wearing makeshift body armor assembled from whatever they could find. 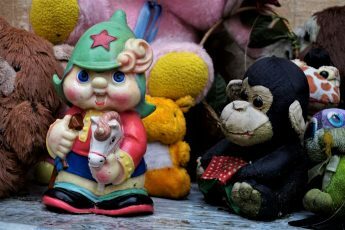 Likewise, the many small memorials are not found in the form of monuments commissioned by the state but of graffiti, or symbolic tombstones laid on the sidewalk, or objects left in the square. 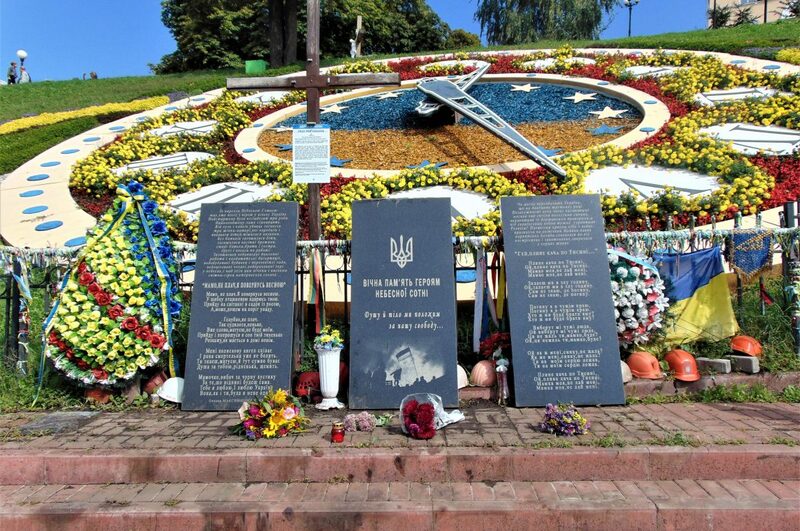 What’s impressive is that the portraits or even that wooden shield that I saw are not attached to anything; still, these objects have not been vandalized or stolen, which speaks of the immense meaning and value that they have for Ukrainians. This also became clear to me through conversations with friends who took part in the demonstrations and the fighting itself. 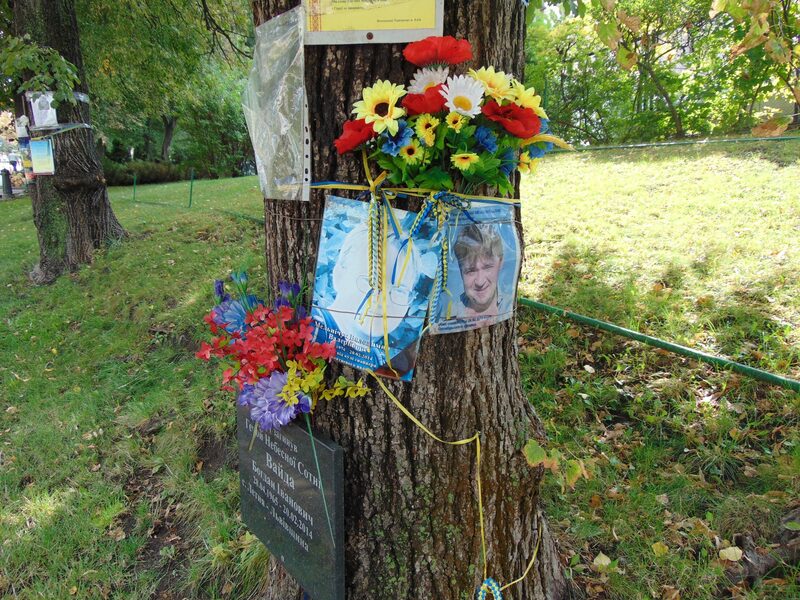 Part of the metal fence next to the portraits was covered in bracelets. I tied the one I had just bought to it and left the square. 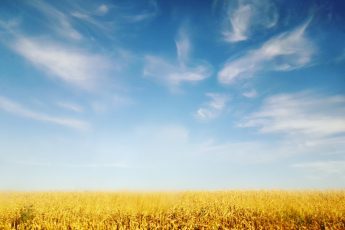 Want to travel to Ukraine? Check out my detailed guide with all the practical information you need! learned a lot from your post!